I thought since my last post was about collecting side show/carny books, that I’d give the synopsis of one of the 100 best mysteries, as carnys are its theme. 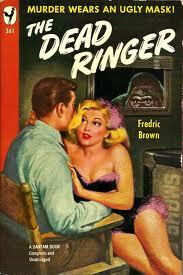 Fredric Brown was a prolific writer. He wrote not only crime fiction, but science fiction as well, and plenty of both. His short stories were featured in pulp magazines and gathered together for volumes long after his death. Many of the short stories involved carny life. One title, The Freak Show Murders, is close in theme to The Dead Ringer. Brown could never be accused of being politically correct–especially since that term didn’t exist when he was at his height of publishing. His characters speak and act as sleazy people did in the 1940s, and that means some are bigoted, sexist and crude. That aside, or, probably because of it, his work is the best written depiction of carnys behind Gresham’s Nightmare Alley. Midgets, in carny mysteries, do not fare well. More often than not, they are the victims. 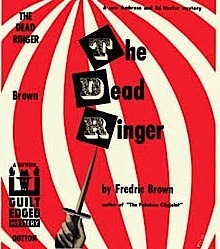 The Dead Ringer is no exception to this thematic trend. The detectives, an uncle and nephew team, tend to mind their own business when a naked midget is killed. Even when a gorilla drowns, they want to stay clear of trouble. But when a child is murdered, they work towards finding the culprit. Ed and Uncle Em Hunter appear in three other titles of Brown’s fiction–The Fabulous Clipjoint, and The Bloody Moonlight, and Compliments of a Fiend. Why just four, I’ve no clue. Too bad, because they were fascinating and fun to follow throughout this fair play mystery. A fair play mystery is one where the author provides ample clues for the reader to catch, and follow, leading to the murderer before the end of the novel. A very good writer can create a fair play puzzle, and still the readers are unable to see the murderer for the suspects. Brown is one such writer. He was ingenious in allowing the reader to think they know all, only to be confounded at the conclusion, which I most certainly was. And that alone made it a shoe in for the best list. Because all the suspects are within one area, the traveling carnival, it should be easier to spot the motive and culprit. Not for moi. I was dazzled by carny life–the various freaks, acts, games. The pickled punks are the most politically incorrect thing I can think of in terms of today’s sensibilities, but in The Dead Ringer and other Brown carny fiction, they are as common as canned fruit. If not familiar with the term, pickled punks, you aren’t alone. This crude name refers to fetuses kept preserved in jars. Usually they are animals with two heads, or two hooves, but sometimes they are human. Bizarrely, I’ve personally seen several examples of pickled punks throughout my road trips–they can be found in very small offbeat museums. Connecticut, North Carolina, Vermont, Indiana, and an actual side show in Pennsylvania had various anomalies on display. You’d think the outraged people who make a career of being outraged, would have sniffed these offensive things to ground, and had them banished, but so far, they’ve not dug deep enough. Although the setting is fascinating for some, it’s because of the clever conclusion that I’ve included The Dead Ringer on the list–that and the super cool graphics of the paperbacks, ha. A footnote–another super carny book by Brown is the original paperback, Madball. No midget dies this time!